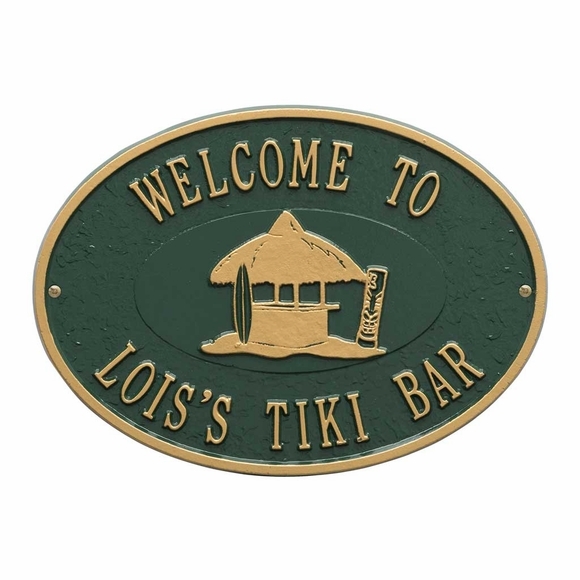 Personalized Tiki Hut Plaque - - Personalized Tiki Hut Wall plaque - - party theme sign extends a warm welcome to your private tiki bar or party spot. Made in USA. Wall mount oval; 14.25" x 10.25". Tiki hut in the center is standard on this sign. Includes the two lines of personalization that you supply. You can use the wording on the sample signs or compose your own message. Line 1 above the tiki hut holds up to sixteen (16) 1.25" characters. Line 2 below the tiki hut also holds up to sixteen (16) 1.25" characters. GG green surface with gold characters (large image). Small images (from left to right): AC antique copper; BG black surface with gold characters; BS black surface with gold characters; OG bronze surface gold characters. Dimensions: 14.25" x 10.25"; weighs 2.8 pounds. Personalized Tiki Hut wall plaque is perfect for any patio family room, rec room, kitchen, deck, or the favored party spot in your home.